"I am protecting and activating our culture", is my motto for all the work I do. With each cut I make through wood I have to remember the long line of people who came before me doing the same motions, telling stories about our connection to the world seen and unseen. Many indigenous cultures around the world see everything to carry spirit and we have an opportunity to find balance and connection in order to be in harmony. This page outlines some of the work I do around the globe to learn more about how we can find balance and healing using objects and natural medicines. While on a dig in the Nunalleq village site near Quinhagak, Alaska this mask revealed itself to me while I was cleaning a house floor dated somewhere close to the 1600's (precolonial). 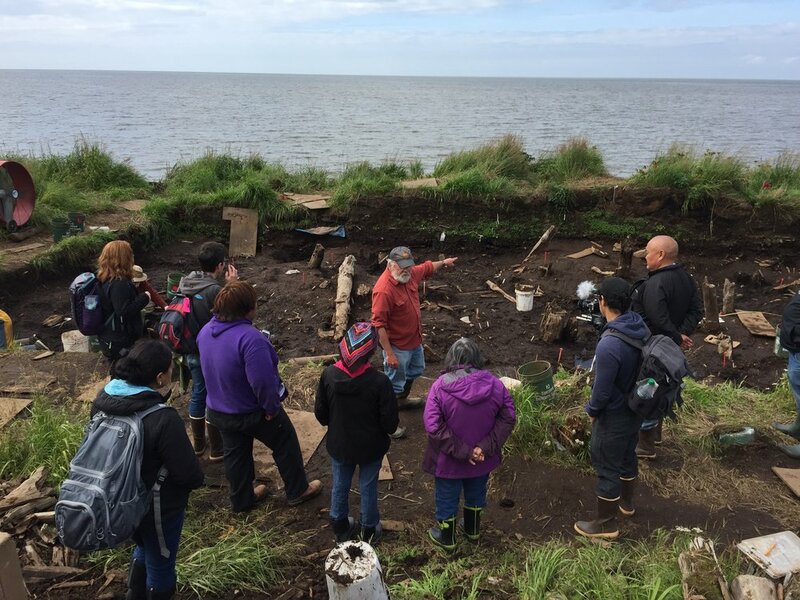 This Yupik village settlement was inhabited some 4 time periods and shows many generations living in the same place. This not only impacted me because this site is in the region of my people the Yupik, but also because I am a mask maker. To find a mask in a place and to pull it out of the ground was a mind bending experience. I will always be impacted by This experience. 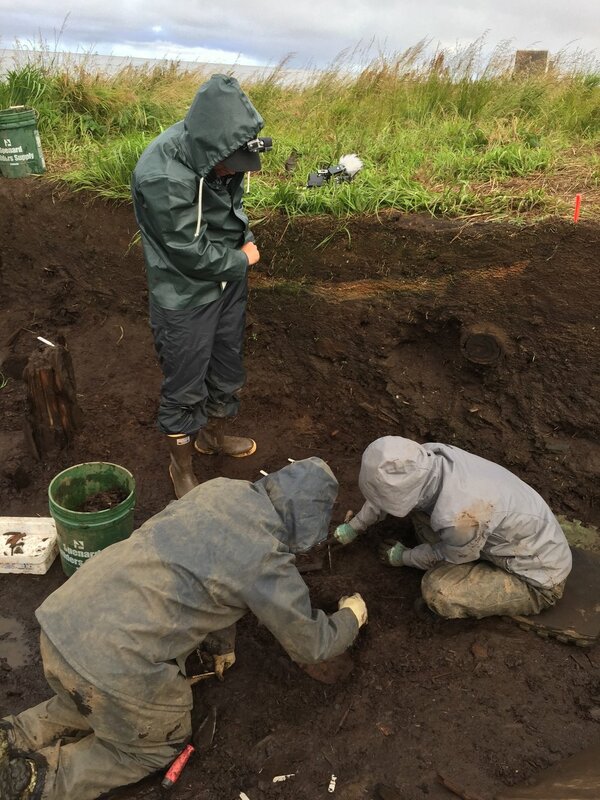 Josh Branstetter, Rick Knecht, Lise Bos all working on uncovering objects in the house floor of the Nunalleq Site. Alice Watterson busy capturing the XYZ axis points of the house floor boards. Each item found is captured in this manner to catalog the direct location for future use to create a 3D model of the space and time. notice behind the site on the hill are the sifting screens used to capture items not noticed in the excavation process with trowels. Lise Bos enjoying time removing the mud floor layer. 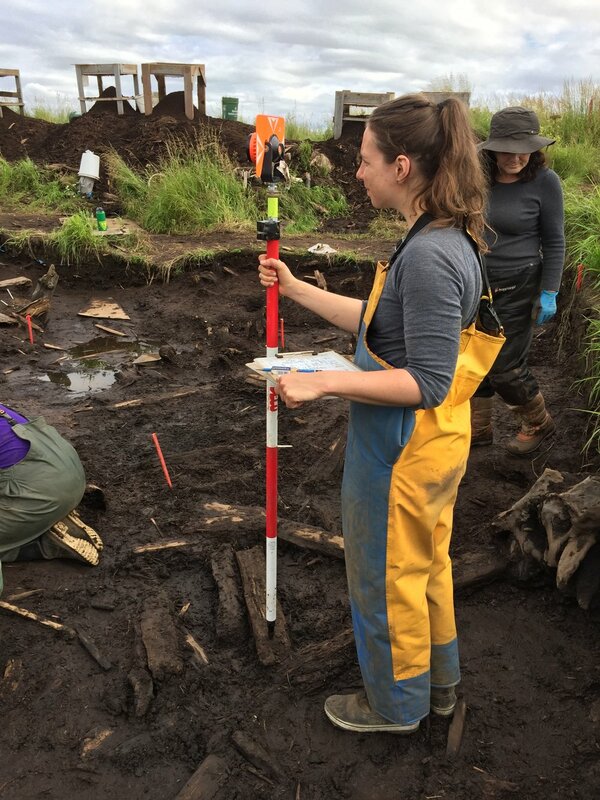 The dig site at the end of the day as items are being tracked with the survey equipment. Visitors of the community would often come and see the progress of the dig. This group was part with the Bethel Community Services Foundation connecting people to the site and sharing informaiton and history about the project. 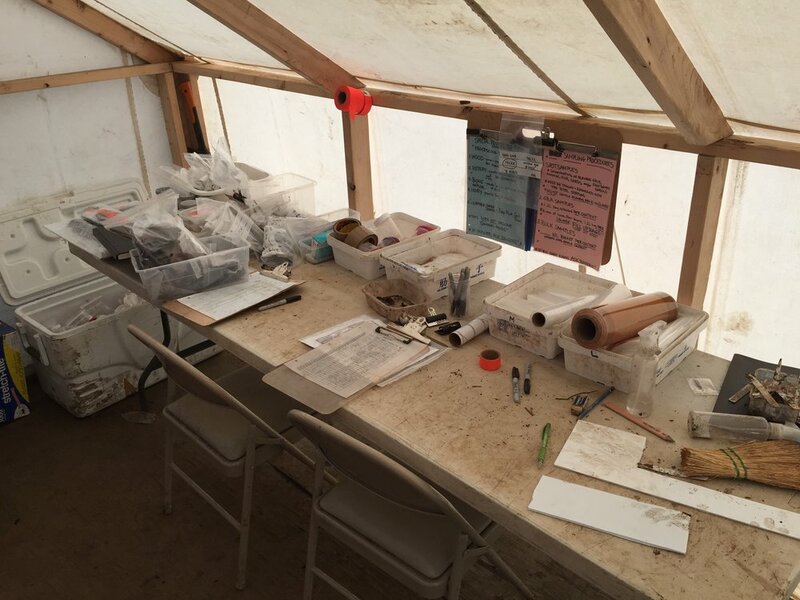 Our state of the art tent lab where all artifacts were processed with numbers corresponding to the square and context layer. Each item would be flagged in situ. 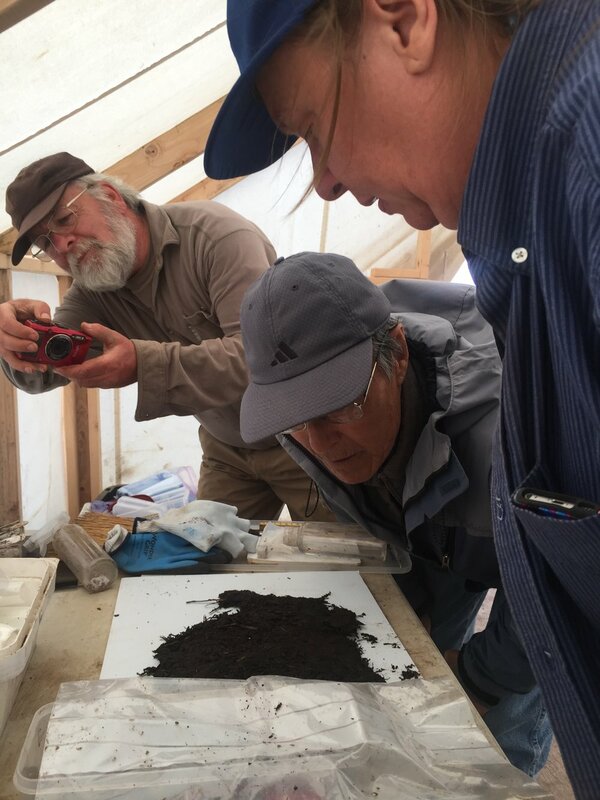 Rick Knecht and John Smith and Tricia examining this woven basket we found while removing a house floor layer. Alice Watterson just after she found this mask in this context layer of the house floor. Rick Knecht and Anna Mossolova packing up to head out after a long days work in the wind, rain, mud:). The edge of town arriving back from the dig site. we would travel by foot and van or a four wheeler. Tricia is carrying a clay lamp used to light the home with a wick and some seal oil. Lise Bos carefully cleaning this woven fish trap. Sharing the objects with the community of Quinhagak. Items are left out for people to inspect and engage with the objects. Each table was divided into like items. Figures carved of various materials found at the Nunalleq on display in the corporation building. 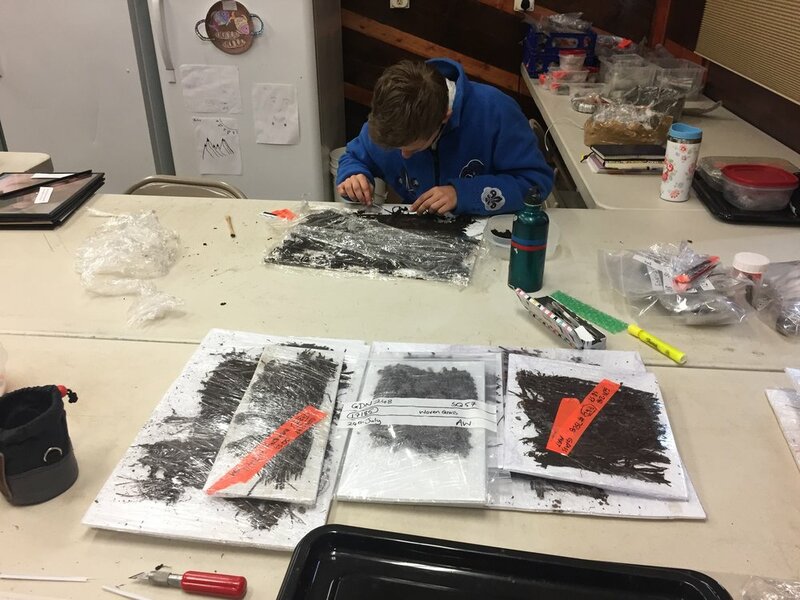 Drawing the mask found in situ after it has been cleaned and now documented. Made some great friends in the community. John Smith, an elder in the community of Quinhagak, Alaska. Nunalleq Ocean view, note the coastal erosion threatening the site just meters away.